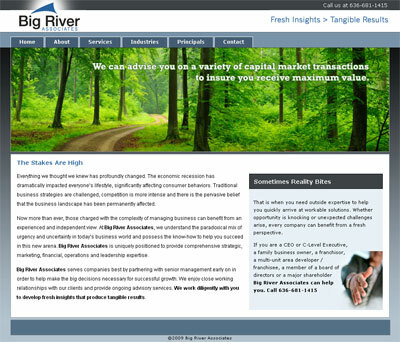 Launched today is a new web site for Big River Associates. They offer a wealth of business expertise from Corporate Strategy to Franchising, Mergers & Acquisitions to Team Building and can leverage their experience in a wide variety of business disciplines. Based on a custom designed, clean template with a palette of cool blues and grays the home page pops with a vibrant slide show featuring the key expertise of the business. Easy navigation allows the site visitors to transverse effortlessly through the site. The web site is the latest brand elements developed for Big River, earlier this month I wrote about the creation of their logo and Stationery set. This entry was posted in Chicago Logo Designer, Logo Work, Web Design Projects. Bookmark the permalink. ← Website Copyright Infringement : An update.